Go ahead and post any feedback about the Alpha here! The start of feedback from the ED forum. I just pushed the game over its win condition. RED / HAVOC WINS THE FIRST MATCH EVER. The Match took a bit over 10 Hours. I would guess that for 6-8 Hours of those a Team of at least two people were consistently trying to destroy stations, bases and factories. After some general getting used to I tried some runs on a few Stations and Bases, together with @INovaeFlavien we destroyed the first Station. Some others also worked on destroying bases, I saw @TheCoach nibling on one. I chilled some and pew pewed away at a unprotected base when @INovaeHutchings showed up. An so we went on a multi hour Installation hunt. Blasting every installation scouted and finding some that weren’t. After destroying every single one we could easily find we employed some team switching to make sure there were further ones. Destroyed a Station above Rethe Prime. After that the Enemy team was majorly outnumbered and only spawned between 5 to 20 NPCs. We hoped this was it but there were two little factories hidden, one on Sarake another on Aresthia. Our commander scouted them for us (thank god) and I finished them of by myself. Most effective for this was a duo of Destroyers … we stayed at distance so only the blaster artillery could reach us. Base defences were not negligible and quite dangerous, and that’s before a whole battle has started. Besides the actuall objective it was fun to see many new people ingame and have some meaningfull PVP arround objectives that you actually want to win. It also was a long … long night. Good to see that everything is working technically. 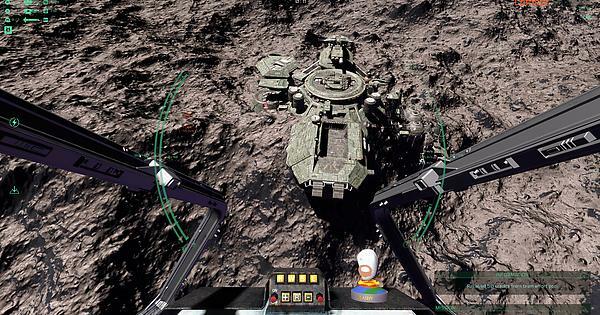 How did you figure out how to destroy that little factory over the asteroid Gallia ? When the match started we couldn’t even hit it … ?! I will update the current version in the thread title for each patch, so we get a running discussion that won’t get lost with future patches. Post any general Alpha ideas, discussion or feedback you want in this thread! For specific patch feedback, see other threads. There were two or three occasions of opposition lasting between 30-60 Minutes. Dramatically decreasing progress, first one was where we two attacked that station. I think it was two players vs two players. Yep, everything seemed to work fine. As for that bugged station. It was red one … so all clear. One of the last factories was a bit wonky when it came to hit detection but I’m not sure, need to look out if the problem reapears. Can I get some help with the download please ? Assuming you followed the process here (https://inovaestudios.com/Battlescape/), is there a specific problem? Have you been able to access the installer download on the website? Did the installer work after downloading it from the website? Was the launcher able to download and install the game? Go in there, right click on INovaeLauncher.exe, and Send to -> Desktop. So I just spent about an hour in the game just flying around and trying to complete objectives. I helped torpedo one small station to death (it was mostly gone anyway) then moved on to Eupraxia Station (the large wheel-and-spokes station in Sarake orbit). This was interesting. First off, I realised I could lock torpedoes from 100km away, which was kinda cool but without subsection targeting also useless in the current build. Then I got closer and discovered a larger battle going on, but I moved too slowly and the station defences soon picked me off. Shortly afterwards, I respawned into a cruiser and proceeded back to Eupraxia. Again, the lack of subsection targeting was a problem and I had to fly around like a very large, slow fighter shooting at whatever was in front of me. It was hard work, but paid off and I caused a huge amount of damage to the station across the space of about 20 minutes. There were lots of NPC smaller ships buzzing about too which distracted the station guns. When they’re able to target better, capital ship weapons will be brutal, and definitely a priority target for the other team. At last, I returned in a bomber and launched my last couple of torpedoes at a defence turret, the whole station went down and the team was rewarded. I-Novae, you are creating a truly awesome game here. The battles feel epic, taking down stations systematically is fun (pending balance and further tweaks), and everything is set within a visually awesome environment. I still can’t get over how beautiful the stations and planets look as you circle, blasting fire out. Then the explosions start and it all gets even better. It really does feel like being inside one of those epic battles from a sci-fi film! FD forum question if someone can help out. Has anyone managed to get the following working? I can get 1 or 2 working but not all three. If he wants to use 3 hardware components he has to use external programs, the game currently only supports 2 devices. Native headtracking isn’t supported at the moment, but the view axis can be assigned to inputs from headtracking devices. TrackIR supports mouse emulations, but it probably wouldn’t be a good experience/worth the hassle. We’ll probably add support for 3-4 simultaneous joysticks at some point, but right now it’s very low priority, as the number of potential players with that many is… very low. Headtracking I definitely want to add native support before release if I can ( it should be fairly easy ), so the current way of using it as a mouse input is just a hacky workaround. EDTracker, for head tracking I hope. Simple and cheap. Quick update on the server population for the Alpha release weekend, compared to other Alpha weekends, all the graphs run from Thursday to Monday. 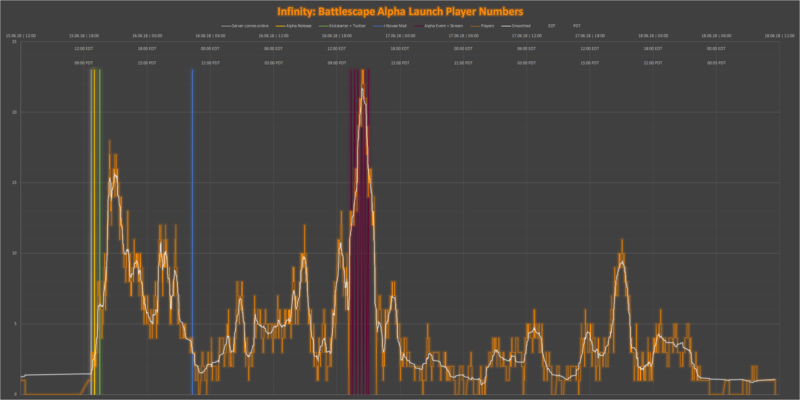 @cybercritic gave me the raw data for the Alpha Release player numbers and I had some “fun” and made a cool graph out of it. Enjoy. the far away textures on the stations really letting the game down at the minute. Here hoping they do something with them before Beta or during Beta. will planets get improved visuals with procedural forests and stuff? Yes, the textures / details are a WIP. Jan ( one of our artists ) has plans to improve them, adding more contrasts, more variety, some colors later on. They are missing ambient occlusion, decals and emissive windows too. From a technical perspective, they suffer from heavy aliasing and lack of shadowing in the distance, which we’ll improve after beta when we refocus on visual fx. They had props in the past with trees and rocks, but it was removed due to being performance hungry. I’d like to rework them with a better performance and higher density, but we’re focusing on gameplay atm, so that won’t happen before beta.